History: DayStar is a familiar name to professional and serious amateur observers of the Sun since February 1975 when Del Woods founded the DayStar Filter Company. Del started learning the optics trade while working at the Spectra Helix company in Sylmar, California. After the 1971 San Fernando earthquake of 9 February caused extensive damage to the facility, Del and others from Spectra Helix came to work for Carson Astronomical Instruments, Inc., a company founded in 1970 by Donald G. Carson at Valencia, California. It was at Carson where the critical concept of a regulated heated filter housing was developed to maintain a nominal bandpass of their SkySpear Hydrogen Alpha filters. After the Carson company closed Del founded DayStar, initially manufacturing Hydrogen Alpha filters and several series of other specialized filters for visual and imaging applications. At least initially, owing to their high cost and specialized nature, these filters would come to be found in most professional and academic solar observatories. Over the next decades DayStar developed other filter series marketed for amateurs who seek a rewarding solar observing and imaging experience. DayStar was the first to set the standards for reliable high performance Hydrogen Alpha and Calcium K-Line solar filters and harness this technology rendering it attainable by many mere mortals. Right: An amazing loop Prominence on the Sun as imaged on 21 Oct 2010 though a DayStar 0.4 Angstrom QUANTUM PE Hydrogen Alpha filter. Filter attached to a 110mm refractor telescope with 4x Powermate Lens at f/32. 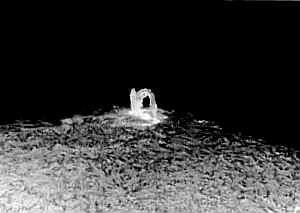 Image courtesy of DayStar (110,780 bytes). The hobby of astronomy is one of the few sciences where amateurs routinely make discoveries and meaningful contributions. Some hobbyists became retailers of astronomical equipment; some names of these retailers which came to "prominence" included the late Ken Hirsch whose regular advertisements in publications including "Sky & Telescope" featured spectacular prominence photos taken by DayStar customers. DayStar filters came to be employed not just on the ground but in space flight too where one sounding rocket crashed upon its return to Earth; among the few recognizable and working components where a DayStar filter. In the mid 1990's Del Woods hired someone whom he trained to replace him at DayStar, but this hoped for transition did not work out. The mid 1990's became a turbulent time in the history of the company, with production numbers plummeting and wait lists for Hydrogen Alpha filters growing to two or more years! Del's absence and later the passing of Ed Hirsh prompted a variety of fictitious rumors about the company. By 1999 Del Woods came back to work at DayStar, bringing his expertise and compassion back to the community until May 2005 when ill health forced Del to retire and sell the assets and knowledge to what became DayStar Filters Limited Liability Corporation. As Del's health declined, Company Seven remained the sole authorized retailer of the DayStar filter line. Even since the days of Del Woods, Company Seven remains the most enduring and longest lived continuously operating representative of the DayStar filter line, and we continue working with Jen Winters and the current team at DayStar. No other retailer than Company Seven has more experience and understanding of these products, or more knowledge of how to implement them with a broad variety of telescopes and other specialized instruments. "since the days of Del Woods, Company Seven remains the most enduring and longest lived continuously operating representative of the DayStar filter line"
Products: The reliable DayStar filter can be found in operation throughout the world's major educational and research institutions, as well as in service of the more demanding amateur. DayStar is best known for providing ultra narrow band optical interference filters primarily for solar observations, these filters transmit a single sub-angstrom bandwidth line from our Sun while rejecting the complete background radiation. However, DayStar has manufactured many custom filters over the years for many applications outside of those original markets targeted by DayStar. DayStar has the technical expertise to design a wide variety of filters and has since branched into other areas of astronomy including the manufacture of a high contrast nebular filter designed to reduce the effects of sky glow pollution from city lights. 1. The lead time for the fabrication and acceptance testing of a new DayStar Hydrogen Alpha filter averages between three to six months, maybe a bit less depending on the model desired. Company Seven does have some filter models in stock at times, but we suggest our customers not buy what we have unless it is specifically that model which they want. 2. In addition to being able to study the Sun on any clear day there are special events occurring every year somewhere on Earth including Solar Eclipses, Venus Transit, etc. As we approach another Solar Eclipse the demand for these filters does accelerate. We urge those who need filters for an event to place their orders six months or more in advance for the more complicated models, or a few months in advance for broader bandpass or simpler configurations. 3. Some DayStar solar filters are engineered to function with an energy reduction "pre filter" or an aperture stop attached on to the front of almost any telescope to prevent damage to the telescope or to the filter body, while the filter body is installed onto the focuser of the telescope. So in addition to the cost of the filter body, your may need to budget for the optional Prefilter for your telescope(s). This prefilter is typically a deep red or yellow colored glass, and can be made by DayStar or can be custom made for our clients by Company Seven to a high specification. The effective system aperture can be as large as the that of the telescope, so we at Company Seven have decided to equip our facility to study the Sun with our Astro-Physics and TeleVue refracting telescopes of up to 206mm aperture! Although for reasons of convenience and limits imposed by our local "seeing" conditions we routinely employ telescopes of only between 90mm to 130mm. Alternatively you can employ the large aperture telescope with a full aperture prefilter, then attach aperture stops over that filter to increase contrast or to compensate for seeing limitations. 4. The DayStar Hydrogen Alpha filter (and some other DayStar filter systems too) are engineered to provide nominal performance when employed with a telescope or lens which is configured to provide an exit cone of light at about f/30. In order to obtain this f/30 beam with most telescopes we employ optional lenses to shape the beam; these include the TeleVue 2X or 4X Powermate 2 inch lens. These lenses resemble a Barlow lens but may incorporate a beam shaping lens to render the light rays more parallel before they enter the DayStar filter. Company Seven: is the most enduring and experienced distributor of the internationally acclaimed DayStar filter systems in the world. We provides DayStar filters to amateurs, to professional observatories, and to research organizations. 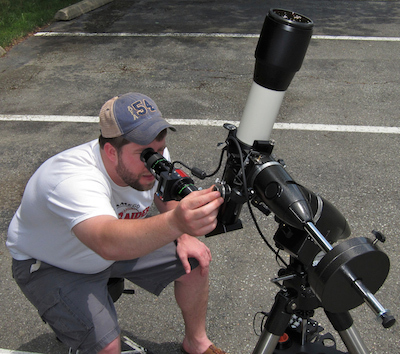 It was one of our customers, Michael Olshausen who with a little assistance from us developed the Questar Solar Observatory system incorporating a DayStar Hydrogen Alpha filter; this system has provided many amateurs and professionals a world wide "portable solar observatory". Other customers of Company Seven have published striking images on the Internet, or contribute images to or write the books on these subjects. Right: visitor observing through our DayStar Quantum filter on TeleVue 85 telescope on a Solar Saturday event outside our showroom (126,533 bytes). Company Seven hosts a solar observing program at our showroom, this convenes nearly every clear Saturday. These events feature our own DayStar QUANTUM PE Series 0.3 Angstrom Hydrogen Alpha, QUANTUM SE Series 0.6 Angstrom Hydrogen Alpha, DayStar T-Scanner 0.5 Angstrom Hydrogen Alpha (a portable model that requires no power to operate), and DayStar 2.0 Angstrom Single Cavity Calcium K-Line filters, among other "white light" filters and purpose built Hydrogen Alpha telescopes which we offer. We invite you to contact Company Seven to learn more about these systems, or visit our showroom to see the DayStar filters in operation. Experiencing The Sun: Most of the DayStar filters we have sold continue to provide uninterrupted service since delivered more than thirty years ago! DayStar filters have been been a component of some of the most exciting astronomical findings in recent space studies history, including the filtering system on board the Voyager space craft that detected the erupting volcanoes on Jupiter's moon Io. And of course these shock and vibration resistant systems have been flown on board the Space Shuttle. Most books and scientific papers about solar astronomy refer to the DayStar as an internationally acclaimed standard of excellence. To see amazing images and movies provided by these filters simply visit almost any major solar research facility web site, including that of the "Big Bear Solar Observatory" web site at "http://www.bbso.njit.edu" or search any number of NASA or university astronomy sites. Above left Photospheric details on the Sun (23,296 bytes). 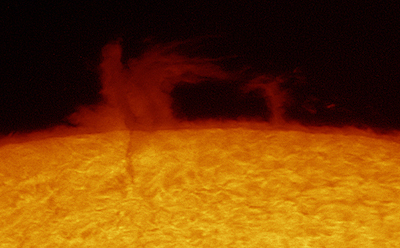 At right Loop Prominence and details on the Sun (15,339 bytes). Both black and white filtergrams produced through DayStar Hydrogen Alpha filters. Few experiences can match observing the dynamic force that exists in the chromosphere of our Sun. DayStar is proud to offer safe, quality, easy-to-use filtering systems specially designed to bring this observing experience to you. DayStar Hydrogen Alpha filters enable professional and amateur astronomers to witness the hidden dynamics of our sun. These unique sub-Angstrom filter systems allow observers to explore many facets of solar research. Watching solar flares evolve above the solar disc, prominences swirling against the inky blackness of space, subtle plage and textured filaments sinuously traversing the sun add to the observer's viewing enjoyment. Smaller features such as spicules and intricate mottles change from moment to moment giving the impression of wild fire. 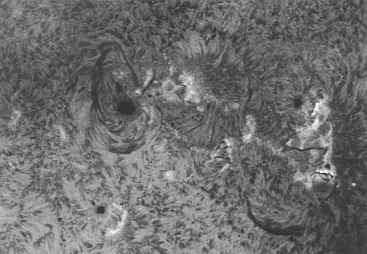 Those observers equipped with DayStar Calcium K-Line filtering systems may view and image calcium plage excited by emerging, existing, or decaying sunspot groups. In Calcium K-Line, plage immersed solar active areas will appear across the entire solar disc, not just at the limb. Prominences are commonly seen in the violet light of Calcium during solar active periods. Observing active areas in Hydrogen Alpha and Calcium are each a wondrous experience. With such equipment as these, it becomes easy to expand solar programs toward new and more intense horizons. We are proud to hear that many consider a DayStar filter to be their most powerful observing tool. With a DayStar filtering system, observational programs are limited only by the desires of the observer. Incidentally "Solar Astronomy Handbook" is an excellent reference guide on the visual and imaging uses of the DayStar filter. The book described the DayStar as the standard measure of excellent performance and value for amateurs and most observatories, or for those whom can not afford the six figure cost of one of our Lyot filters. You will find this book for sale stocked among many other solar-related titles at Company Seven's showroom book case. We are so confident in a filter line that has such a long term proven history in observatories that when used as directed, the DayStar Hydrogen Alpha filters sold until May 2005 are guaranteed for TEN (10) years from date of delivery from Company Seven against defects of workmanship or materials. Filters delivered after March 2006 under the new ownership of DayStar Filters Limited Liability Corporation also bear a TEN (10) year limited warranty. Should the filter become inoperative due to optical or electronic failure, DayStar or Company Seven will repair the filter or replace it at our discretion with an equivalent filter at no cost other than return shipping to the customer.